An early dinner at Gourmet and Company followed by a flawless performance by the Johnson City Symphony Orchestra is the perfect date night for us. 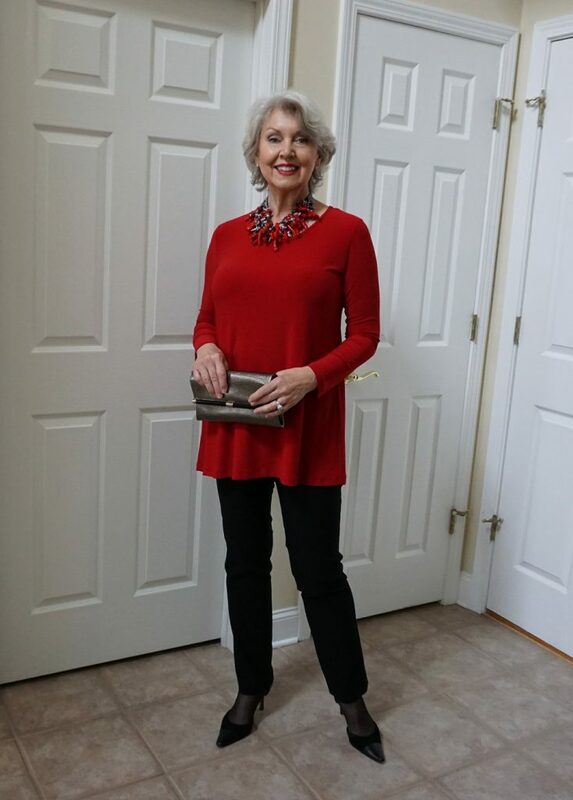 My spirit longs for warm weather and sunshine, so I wanted to wear something colorful, even though the rain was coming down and the night was cold. 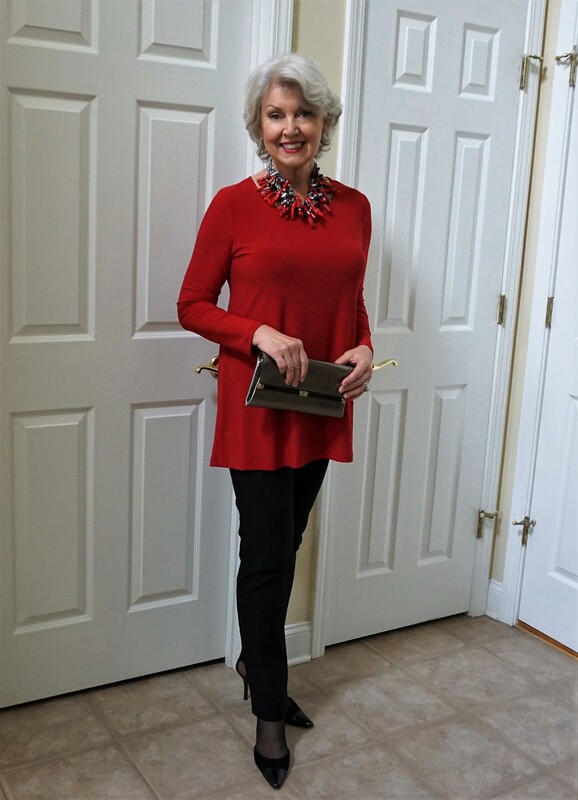 A Clara Sunwoo tunic with long sleeves in a deep red with my chunky red coral necklace and a DVF gunmetal clutch bag to accessorize it felt festive and appropriate. The straight leg black pants with a wide, smooth waistband are by Nic & Zoe via Nordstrom. The Anne Klein shoes are a few years old. I rarely wear heels now, other than for date night or maybe lunch with friends. The snow leopard print coat (not fur) was from Loft a few years ago. I fell in love with this necklace as soon as I saw it in J.M. Bradford on Hilton Head Island a few years ago. It weighs about ten pounds! Accessories can elevate a simple outfit and take it to a more dressy level or bring it down to an everyday casual look if the clothing items are without gimmicks or trendy features. I could also wear this tunic with white pants and sandals with a long tassel necklace for a more casual warm weather daytime look. I always look for clothing that can be worn in a variety of ways with different accessories. This Clara Sunwoo top is from My Fair Lady last year. I have a few new things from there to show you as soon as it gets warm enough to actually wear something for spring. My friends at My Fair Lady are generously offering my readers a 15% discount on your whole purchase until the end of March with the code: Sunshine. Great look. Class with ooomph! Red is your color! You look very happy! Great pictures. Oh I so love the red with the leopard coat! I’m anxiously waiting for warmer weather too – we have the sunshine, but it’s still winter temperatures here. I would appreciate any help with jewelry since I do not like my drooping neck worn with collarless tops. I have purchased several of your scarves and now am interested in collecting 2 or 3 jewelry pieces. 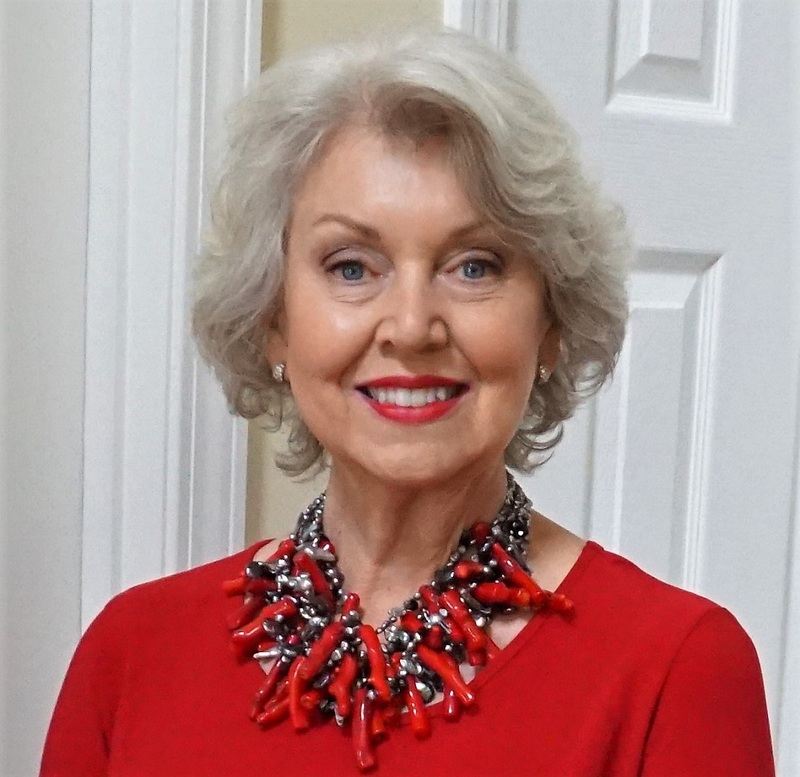 A necklace that has a lot going on like the one I am wearing here could work well for you. I also like to wear long ones with a more substantial chain or beads when the summer comes. What size is your top? Thanks! I love your style. I wear a lot of chunky jewelry and like how good you look. And think what would Susan do. Thank you so much for all you share. Wow! You look fabulous and ready for any elegant occasion. I love every piece of this look. I love the combination of red and black. This outfit is simply fabulous. 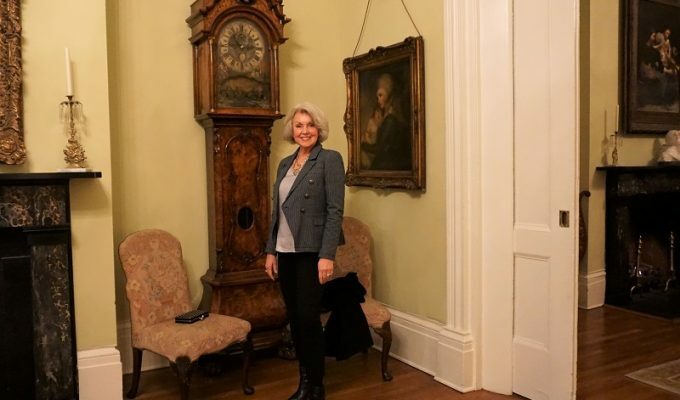 The colors, jacket, great necklace – you hit it out of the park! You look so glamorous and red is a great color on you. Thank you, Susan. You look lovely as always. You know what I love? My Petra Mieren necklace like yours. Not ten pounds but very chic. Wow! 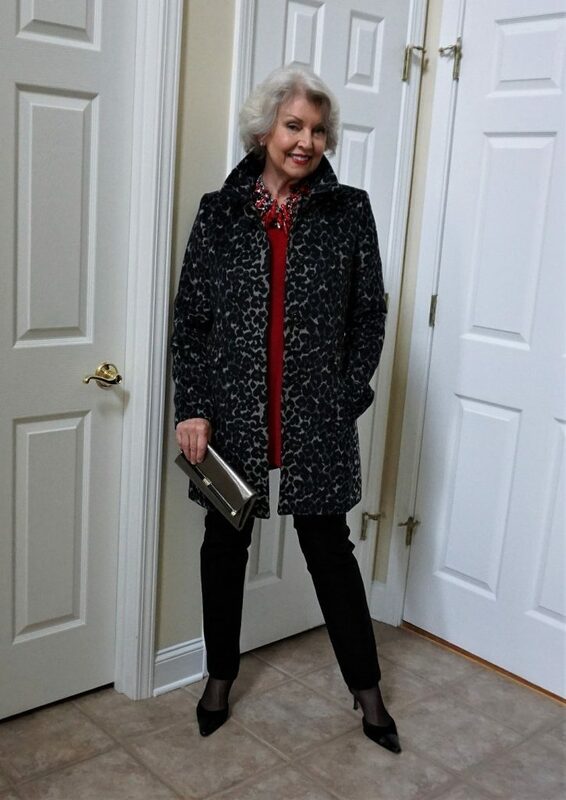 The top, pants & shoes are perfect together (red & black have been my main go-to since I was in my 20s) but that gorgeous coat pulls it all together. And then the knock-out necklace elevates it one more level. I’ve always favoured assertive, bold jewelry & I like how you use it to accentuate but never overpower what you’re wearing. I must admit you’ll find us at a rock concert long before you see us at an orchestral event, but that outfit would still work for me for date night at a nice restaurant. Great inspiration, Susan, as always! Red is your color! Great outfit! Elegant and glamorous! Looks like a fantastic evening. As always, you look lovely. The coral necklace is stunning! Can you tell me exactly what tunic this is? It is gorgeous, but I wasn’t sure which one it was when I went to the site. Thank you! Awesome look Susan, love the coat, the necklace and your new hairstyle! I really need help updating my hairstyle now that the gray is coming in, BUT it’s hard….. thanks for all your inspiration! Gorgeous look, perfect from head to toe! You look stunning in that outfit and I love the coat! I saw that at Loft but, couldn’t afford it at the time. 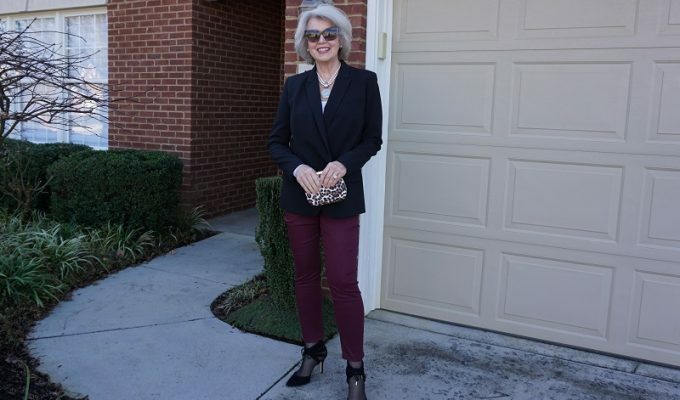 Fabulous in all respects: top, pants, necklace, shoes, coat. What a fun coat and necklace!!! You look stunning!! 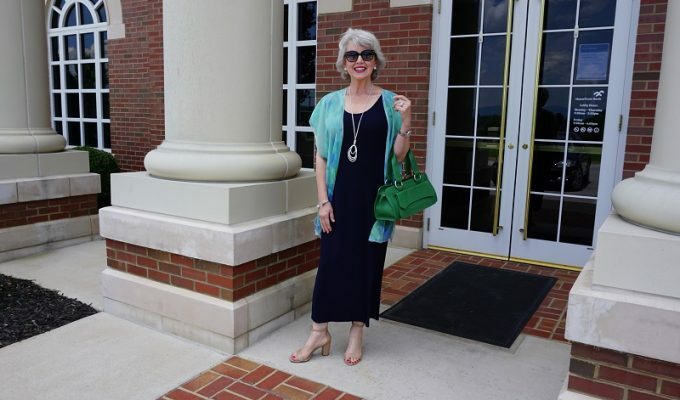 Thanks for sharing how you wear the pieces in multiple ways!! Always look forward to your posts and videos!! What a fabulous necklace and fabulous overall look. Love it! Thank goodness you are back in heels! I know you say you no longer wear them, but they take 10 years off, make you much more elegant and make you look less dumpy. I worked with an 80+ year old European woman who never was without 3” heels. She was an inspiration. Thanks for the link to the red tunic, Susan. It’s on sale (love to buy things on sale!) for $39.00–plus if you provide an email address, you get an immediate coupon for 15% off. I don’t have any red in my wardrobe, but yesterday I bought a new Chanel red lipstick (first time for red for me) and now I need a perfect top to “debut” my new, bold look! This is perfect. Thanks for the inspiration. You should definitely wear color more often! That top looks great on you. You look wonderful, especially love the coat. I laughed when I read that the necklace weighed about 10 lbs. This is gorgeous!. I loved the casual vacation looks, and I think you knocked the ball out of the park with this dressy outfit. What an inspiration you are. Wow! You in red! Fabulous!! You look absolutely fabulous! What an outfit. I just found your blog and can’t wait to dig into it. I’m a 59 year old frump who has given up looking good because with my body there are just waaaay too many obstacles to looking good. It’s making me sad, and sad for my wonderful husband who deserves better. Perhaps I’ll find some answeres here! Your necklace is stunning and you look great in that red top. I’m longing for sunshine and real spring weather, too. We’ve had more than a week of rain and clouds here, with more days of it to come. Sunshine will be greatly appreciated when it finally shines again. You look lovely and I just want to say thank you for sharing what you are continually learning! You have been a true inspiration to me in more ways than just fashion. Thank you. I’m so pleased that what I share has had a positive impact.